I was both excited and worried to read the third and final installment of Lauren Oliver’s Delirium Trilogy due to the mixed reviews I have been reading. Many have expressed their negative feelings toward the book. 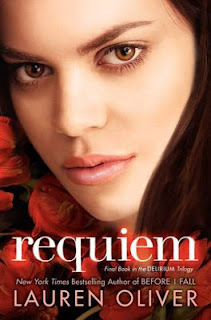 And though there are also a number of people who really liked Requiem, it cannot be denied that of the three books in the series, it has the lowest average rating on Goodreads. What makes Requiem different from the first two books is that it was told in both Lena and Hana’s point of view. Lauren Oliver lets readers hear the voice of two very different people who are worlds apart: Lena, struggling and trying to survive in the Wilds; and Hana, trying to figure out life after being cured. Just like in Pandemonium, she wonderfully made both ends meet. I’m going to start with Hana… It was interesting to read how her life has been after being cured; how she managed to have courage despite her doubts and confusions. Though she had her weak moments, and I really mean weak moments where she should have fought back and stood up for herself, I still think her decisions (especially her last one) made her a stronger person. What bothers me with Hana’s story is how it was ended. She is one of the important characters in the book, but it felt like she isn’t. Her final chapter did not make it clear what really happened to her or what might happen to her in the future. Lena’s story is annoying, frustrating and just uuuugggh!!! Why? Because of Alex and Julian. Well, it’s not really them, but Lena’s behavior because of these two guys. Some readers almost died at the end of Pandemonium, and everyone would be asking “What would happen now that Alex is back in the picture?” I’ll tell you what. Lena is confusing and sometimes annoying. But it’s quite obvious who she has really chosen. Aside from that, Lena’s chapters are mostly about survival and the impending fight of the resistance/invalids. So we really get to see the new Lena here, that is if she is not acting a little too aggravating. Requiem, in general, has been a constant anticipation of how all the fighting and resistance would end. I have not really been paying much attention to whom Lena will choose because as I have said, it’s obvious who she really loves, and that’s enough for me, regardless of who she really ends up with. Given that case, I guess I got what I wanted because Requiem is really devoid of the sweet and stomach-clenching romance we experienced in Delirium. What I was waiting for was the big explosion of events, like everybody getting stirred up, all cureds, DFAs and the government against the resistance and the invalids; maybe a big fight that would wake up the whole nation. Yes, we did have a lot of fighting in Requiem, and it’s as brutal as this book can get… bombing, shooting and burning. It was good. But it may not really be good enough for other readers. I am of the same opinion that Requiem is not as good or as strong as the first two books. But I still really liked it. I still think it was great. I liked how Lauren Oliver wrapped the whole thing up. Something has finally been done; people have taken a great risk and acted upon what they wanted. Though with a touch of uncertainty, they took down the walls and tried to see what’s ahead of them. Plus, I think Lauren Oliver made sure Lena was still seen as teenage girl despite how she evolved throughout the trilogy. She is not the exaggerated heroine who plays a really big part in changing the world. She is sometimes weak and vulnerable and selfish; someone big enough to make difference, but someone who knows she can’t save everything. And with that my fellow readers, I conclude that this is a great end for the story. For Lena’s story.